Margaret Murrey, Susan Jennings, Suzy Parker, Briggs Shoemaker, Babs Sabick and Sara Spurlock stand from left to right. Babs Sabick is shown with quilt blocks Jacobs Ladder, Wagon Wheel and Monkey Wrench. 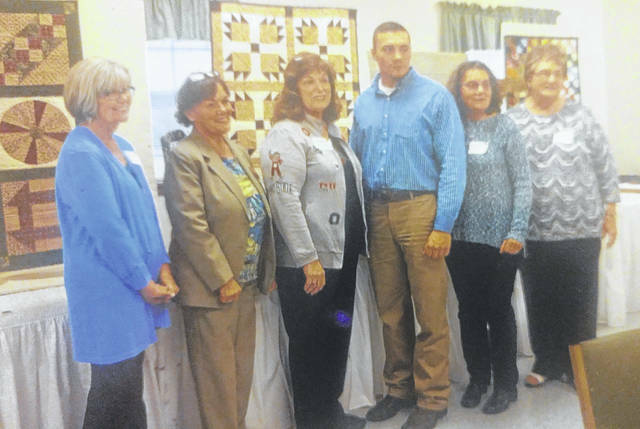 GALLIPOLIS — The Ohio Association of Garden Clubs regional meeting was held Oct. 28 at the New Life Lutheran Church in Gallipolis. Katie Shoemaker, Outgoing County Chair, welcomed members of clubs from Athens, Meigs, Gallia and Washington Counties. Denise Bonecutter opened the meeting with devotions and song in memory of members who have passed this year. Suzy Parker, OAGC first vice-president, introduced Susan Jennings who was installed as regional director at convention in July. Parker then installed her officers, Margaret Murrey as treasurer, and Sara Spurlock, secretary. She updated members on events scheduled by OAGC in 2018, including bus trips to the Philadelphia Flower Show, Falling Waters and PHipps Conservatory as well as E and J Exhibitor and judges school in April and Natur Study Retreat at Camp Koinonia in Geneva, Ohio. Sheila Curtis, OAGC sales chair and judge presented the Outstanding Garden Club Member award to Gladys Cumings from Meigs County and superior award certificates to Meigs and Washington County garden clubs for flower show contests. Allie Clagg from Gallipolis was the winner of this year’s OAGC and region 11 scholarships. In the morning program, Briggs Shoemaker, director of Ohio Farm Bureau for Athens, Meigs, Gallia and Lawrence Counties and recipient of several OAGC state and regional scholarships, spoke about his experiences in the field of agriculture since graduating college. He spoke of how technology is key to farming these days nad that droves are now being used for taking promotion videos and three-dimensional field mappings for custom landscaping and field scoutings. The afternoon speaker was Babs Sabick, past president and present sales secretary of OAGC. 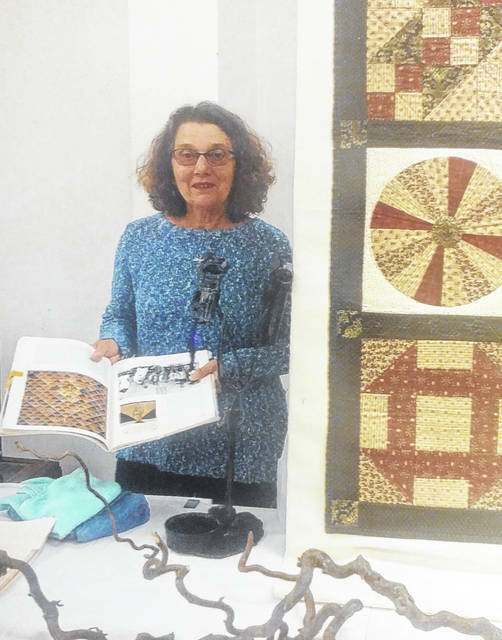 Sabick’s program was on the “Secret Story of Quilts and the Underground Railroad.” Using freedom quilt blocks in quilts she made, Sabick illustrated patterns used to relay messages to runaway slaves on safe or unsafe harbors on their trek north to Canada. Sabick incorporated floral designs to accompany the quilts displayed and spoke on the history of the 1800s.